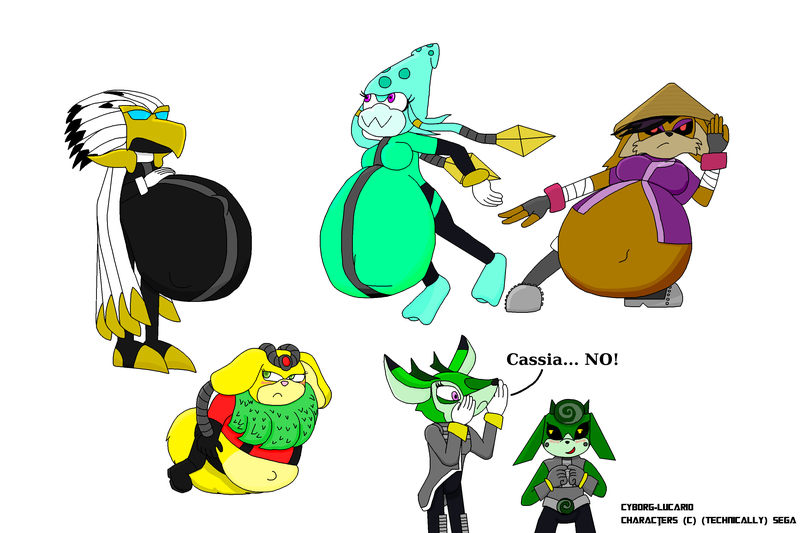 Here we have the female Egg Bosses from the Sonic comic (in rebooted universe) who I have drawn big bellies on most of them. Though Thunderbolt (bottom left) is just slightly fatter than she really is (yes she is fat, and even though she's meant to be nonredeemable evil so is she still adorable). Nephthys (Top left) is definitely being redrawn because her cape is not meant to be a cape, but feathers (which of course will be done in the not distant future). She is really cool and intimidating looking, but is in reality not an awful person and only works for Doctor Eggman just so that there will be as little conflict as possible in Shamar. So do I think she's hot if I made some fetish art out of her? Uhm... the author or editor may have mentioned it in the comics but I forgot, but I only found out her age after I finished the sketch. She's 42 years old. Let me rephrase that. She's old enough to be most peoples mother. Yes, it's kind of awkward, even though she doesn't look bad. Also, the fact she's named after an Egyptian goddess is cool too. Abyss (top mid) is a character that just got introduced in the current Sonic Universe story arc "Eggman's dozen", and the only thing I know about her is that she's a pirate queen who rules the south sea, has no respect for her elders and is cute. Conquering Storm is a character that I remember seeing in the comics before the reboot. Though I didn't read much of it, so I don't know much about her aside from how she is in the current comics. And she's cool. That is all I have to say about her. And lastly we have Clove (bot mid) and Cassia (bot right) who I decided not to do anything weird with. This is more Clove trying to tell her cyborg younger sister to not do anything stupid.